As the mom of five boys I claim my absolute right to indulge in girly spa treatments whenever I’d like. As a woman who lives in the dead center of the middle of nowhere, I have to get a little creative about that. It usually involves pulling a nice deep bathtub of hot water and hiding in the locked bathroom with a glass of wine, a space heater going full blast, some music on the cassette player (Yes, I still have one. You do not? How do you play all your great mix tapes from the 80’s then? Hmm? ), and a couple bars of chocolate. I’m not a big fan of perfumed bubble baths or lotions, because somehow or another I have a faulty sniffer and all I get is a snootful of chemical smells. I do, however, love essential oils and scents that come from real, identifiable yummy or otherwise nice smelling things. Since my skin gets terribly dry in the winter (I blame the fact that we heat our home exclusively with wood! ), I have to be sure to moisturize carefully. Ready for another little neurotic confession? I don’t like most body lotions. Aside from the heavy-hand with the scent that most manufacturers use, they make me twitch because they’re either so thick that they don’t absorb and sit on top of your skin for what seems like hours, or they’re so thin they absorb immediately and don’t seem to do much good. Somewhere along the line, I started using extra virgin coconut oil right when I got out of the bath or shower and never needed to try another moisturizer again. It DOES absorb super fast, but it seems like it seals in the skin’s moisture and keeps me from clawing my legs off due to itchiness. This brings me to another source of The Dreaded Winter Itch… dead skin. There’s no getting around it, you need to get that dead skin off of you to keep from getting all flaky and itchy. You don’t want to use any harsh methods because that’ll just make it worse. Made from extra virgin coconut oil, essential oils, and regular household sugar, Sugar Body Scrubs are the perfect solution. Sugar is naturally abrasive, so that takes care of the sloughing angle, but the coconut oil follows up the scrub by soothing the skin and sealing in moisture. Whu-BANG. Smooth skin that doesn’t make you feel like a scratchy neurotic. I make my own, naturally, because I control what goes into it. No funky, harsh, drying, off-smelling chemicals are here; just pure, natural, gentle ingredients that leave you smelling like gingerbread or candy canes. They make gorgeous gifts, too! What gal wouldn’t love to get a beautiful, sweet-smelling, pampering treat this Christmas? What do I use to store the Sugar Body Scrubs? Whatever jar or container you use is going to get slippery, so I advise using plastic because it’ll be less potentially dangerous if it slips and falls. Try to choose a container that has a tight fitting lid. Remember that someone will have to get out what you put in, so pick a container with an opening that is wide enough to fit in your entire hand. Want a gift tag for it? No problemo! Here are free downloadable, printable gift tags (4-inches by 6-inches for your index card printing convenience) for both varieties. Happy Christmas and smooth skin for the world! Stir together the brown sugar, cinnamon, ginger, allspice, nutmeg, and clove (and salt, if using) in a medium sized mixing bowl. Gently heat the extra virgin coconut oil in a microwave or saucepan just so that it is soft and partially melted. This should only take a few seconds. Pour it over the brown sugar mixture and smash it all together with a fork until everything is evenly distributed. Pack into a container or containers with tight fitting lids. Store at room temperature for up to six months. Use as needed. Stir together the sugar, peppermint essential oil, vanilla extract, and salt (if using) in a medium sized mixing bowl. Gently heat the extra virgin coconut oil in a microwave or saucepan just so that it is soft and partially melted. This should only take a few seconds. Pour it over the sugar mixture and smash it all together with a fork until everything is evenly distributed. If you want to make a striped body scrub, transfer half of the mixture into another mixing bowl and mash in the red food colouring drops until evenly coloured. Pack into a container or containers (alternating white layers with red layers if you’re striping it.) with tight fitting lids. Store at room temperature for up to six months. Use as needed. *A tablespoon of salt can be added to the mixture to increase the ‘scrub factor’. Omitting the salt keeps the scrub more suitable for sensitive skin. I get super dry skin in the winter too. MI weather and all that… can’t wait to try this! How fun! I love taking hot baths in winter and using foofoo products for my skin. Now I can make them! I will have to make one of these for me and one for my mom as quick last minute Xmas gifts. Wondering if you have any thoughts on an orange scrub? I would love that too. Just not sure how to go about getting orange oil. There IS orange essential oil and it smells lovely! I buy Aura Cacia’s Sweet Orange Essential Oil via Amazon. Ah, how I love Amazon. These are such a wonderful idea! I got my aunt for secret santa this year, and I’m definitely making these for her. My only question: have you noticed whether the food coloring (for the candy cane scrub) dyes your skin? These look lovely! 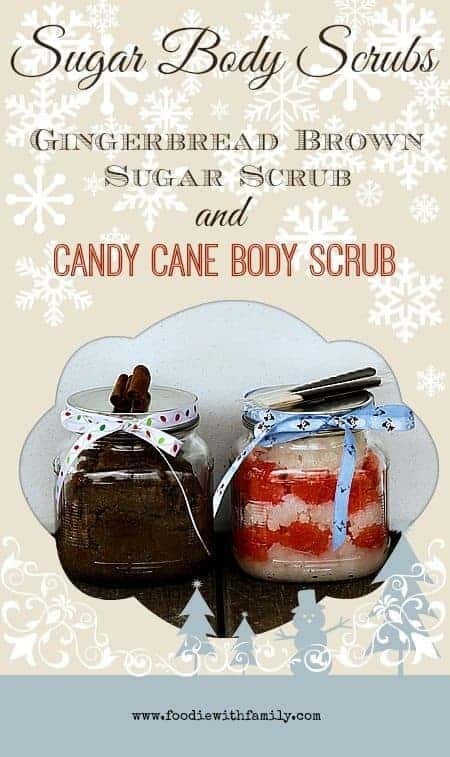 I do like a good sugar scrub, so yippee to making my own. I am worried about the red food coloring, but I am sure you have tested it yourself without any ill effects? We have a white shower insert. Thank you for sharing. You can use the juice from pomegranates or raspberries if you are worried about food coloring. These sounds AH-mazing! 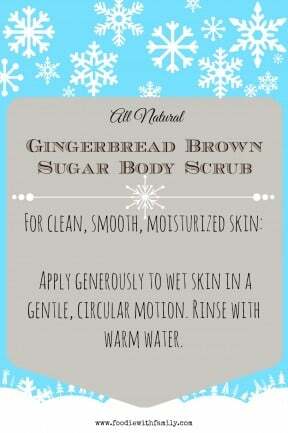 I have the ingredients on hand to make the candy cane scrub! Yipee! But how do you keep from licking yourself?! hi! i am definitely going to be making the peppermint one his week….question…does the red food coloring come off on the skin at all? I haven’t had any issues with the colouring sticking to me, but I don’t leave it on really long, either! This sounds great! Being the only female in our house I know just how you feel. I’m going to make both of these and give them a try. Thanks! Seriously, I’m making jars of this for the ladies who volunteer for me — I always like a simple handmade gift and you saved me this year! Thank you.